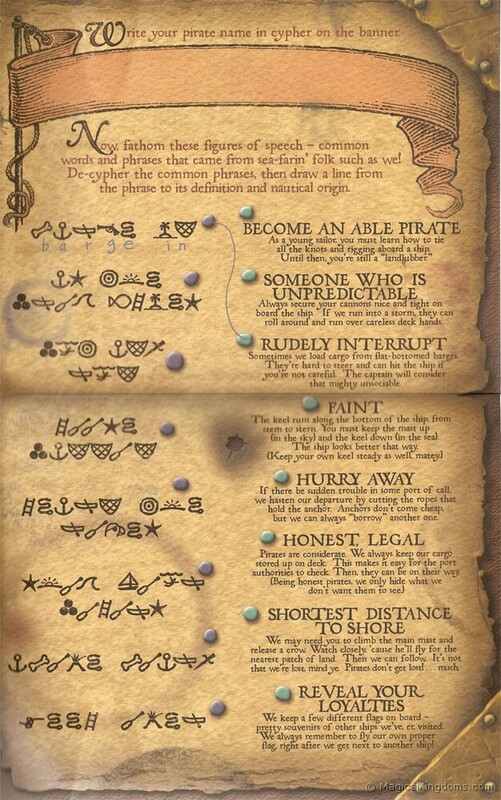 Deciding it was indeed a pirates life for me, I of course accepted. 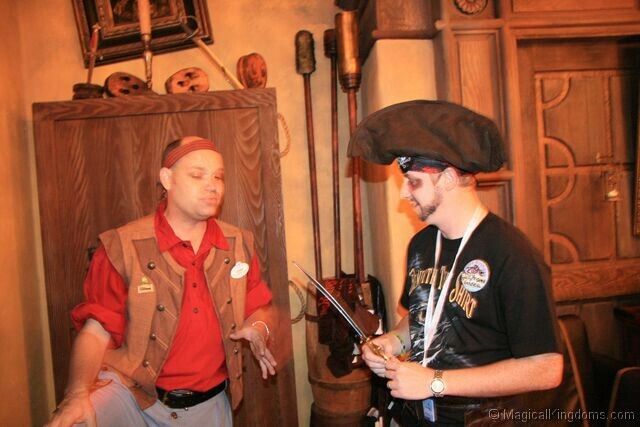 As it happened, the date for my piratey makeover coincided with our ‘Mickeys Not So Scary Halloween Party’ night, thus my transformation from park guest into scurvy knave would blend seamlessly into a mass of other weird and wonderful costumes. The day soon arrived and we all trooped over to Adventureland. 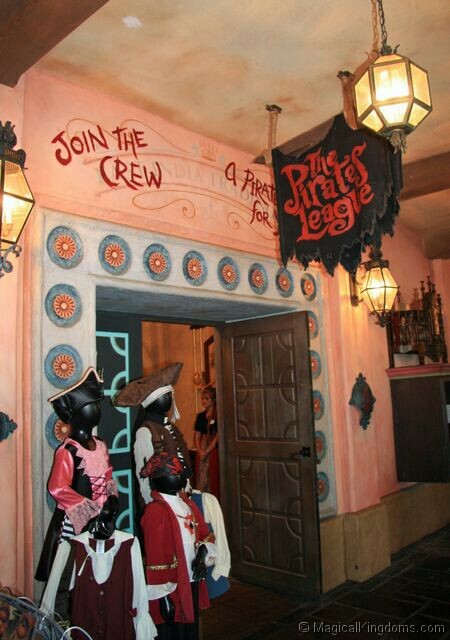 The Pirates League rooms are located on the right hand side of the adjoining Pirates of the Caribbean attraction, near to the seasonal El Pirata y el Perico dining area. I chose the ‘Black-eyed Jack’, which seemed to be the most popular choice from those I saw at the time. I was then shown a range of hats to add to my look. These are optional and cost extra, however I opted for the mid priced tri-corner. 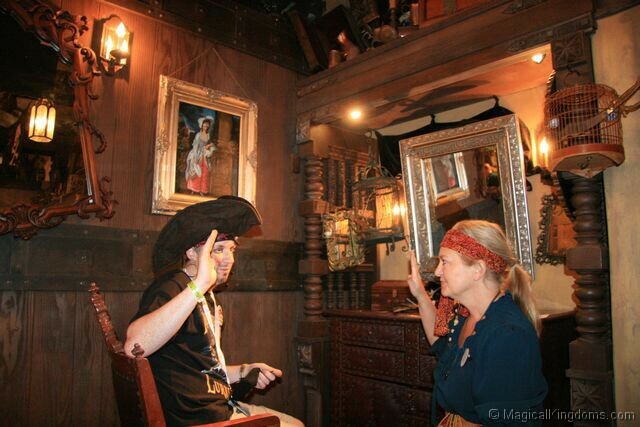 It should also be noted that other items are available both inside the outside the Pirates League should you wish to complete your costume. Most items are also available to buy outside the Pirates of the Caribbean attraction, should you want to purchase anything ahead of time. 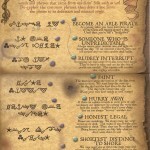 Upon being called, I was told that my own name was not acceptable for pirateering, and a new one would be given. 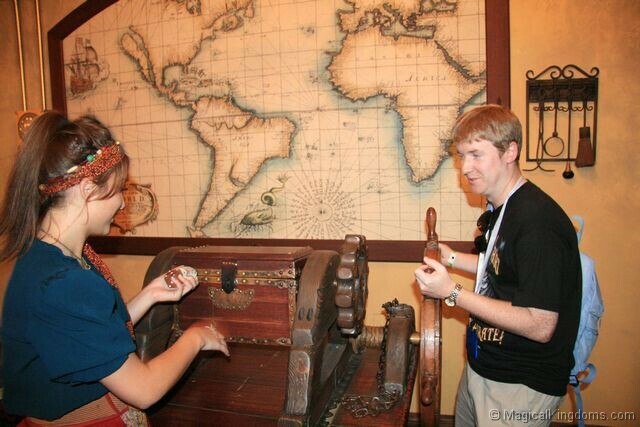 Two dice were handed to me, one black, one white and then placed inside a revolving treasure chest. 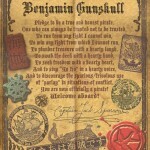 I had to give it two turns before the dice were removed and the resulting numbers, coupled with my month of birth, were matched against an ancient parchment and thus ‘Benjamin Gunskull’ was born. 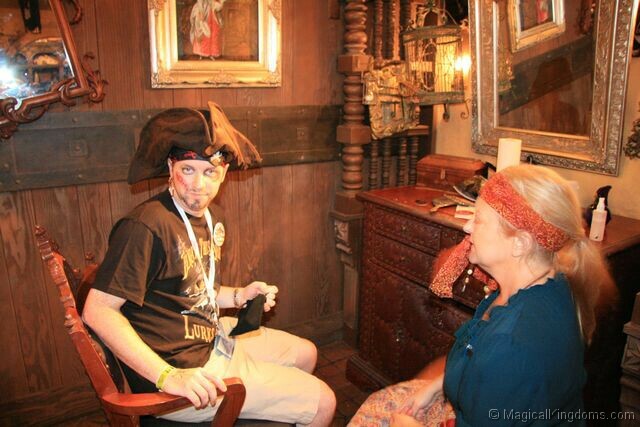 The pirate wench noted that it was my month of birth and handed me a birthday button with my new pirate name written on (this had interesting consequences later in the day…I’ll get to that shortly) before being directed through into the main chamber of the experience. I took my seat and was swiftly transformed into ‘Black-eyed Jack’ via a variety of brushes and sponges. Black eyes, scars and stubble applied, a remark from my other half that it was “an improvement on before” ignored, and bandana tied. 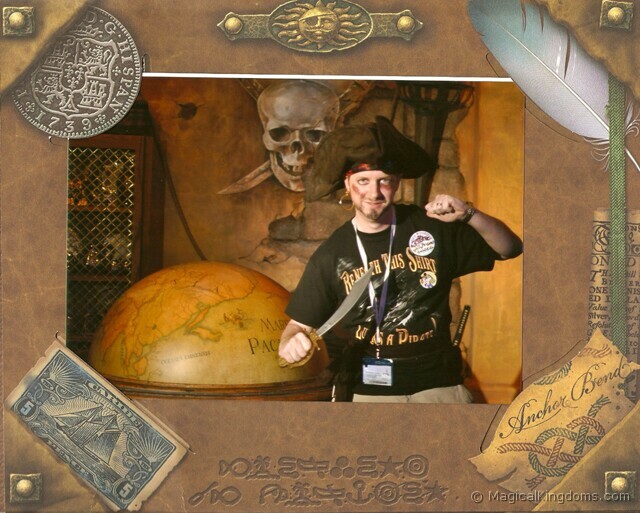 I was then given a couple of accessories to complement my new pirate look – an earring, eye-patch and set of false teeth. 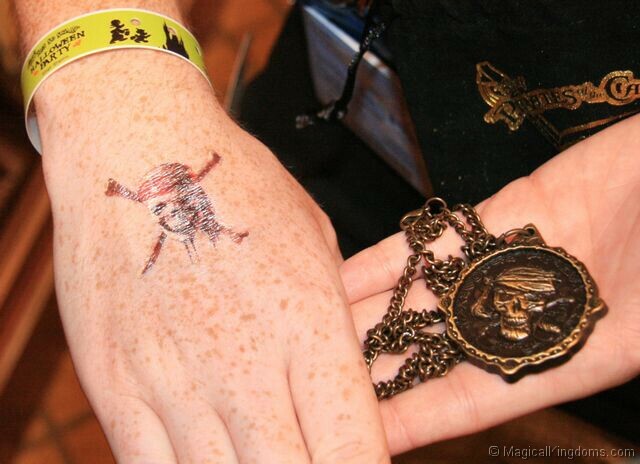 The Cast member then finished things off by adding the mark of a true pirate… a Pirates of the Caribbean tattoo! Thankfully, it was only a temporary mark. 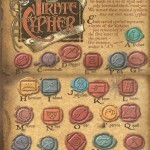 I had to recite the pirate oath, before being directed to another corner of the room. All in, the make-over part of the experience took around 15-20 minutes. Some of the other ‘looks’ may take longer though. 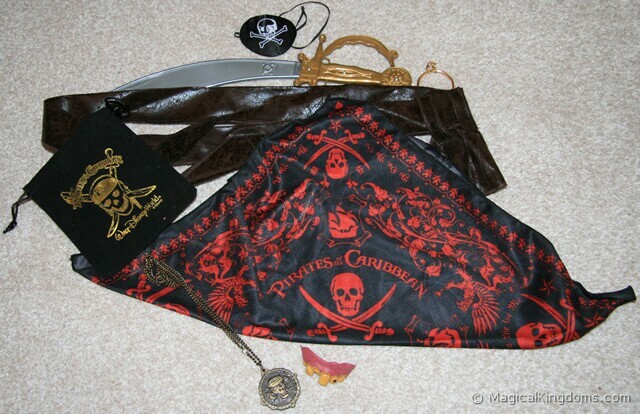 A fellow pirate offered up more goodies to assist my future plundering – a pirate sash and cutlass. Every good pirate gotta have a blade! Made by that great Spaniard, El Plastico! One more surprise was in store. The corner I’d been led into also contained a doorway. 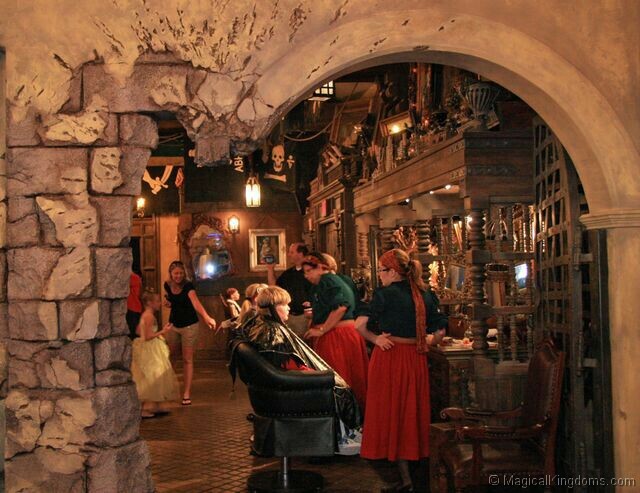 The Cast Member indicated that this was in fact the entrance to Captain Jack’s secret treasure room, and asked if I would like to enter. “Stand aside,” I motioned, my vicious sword at arms. You exit back into the front room of the building, and are offered to purchase an official photograph of your experience. Again, this is up to you whether you wish to buy or not. 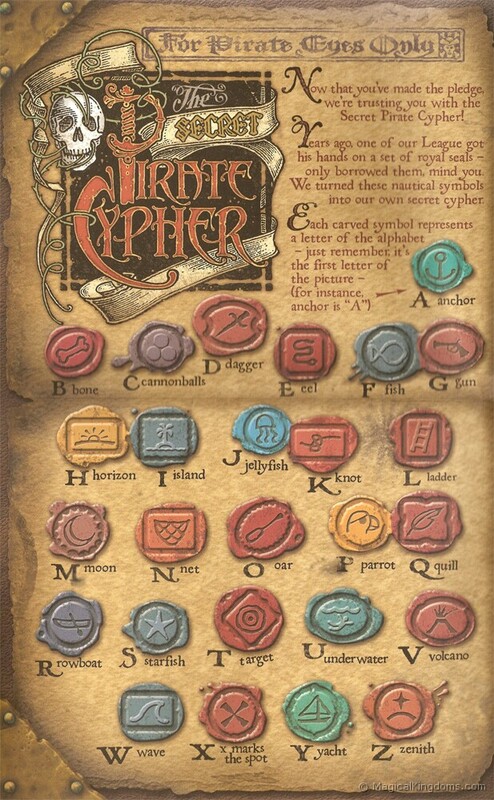 What isn’t optional however is the final payment, where you will unfortunately have to part with many of your hard earned doubloons, depending on the package you’ve chosen. This was my photo, the folder it came in was a nice addition. 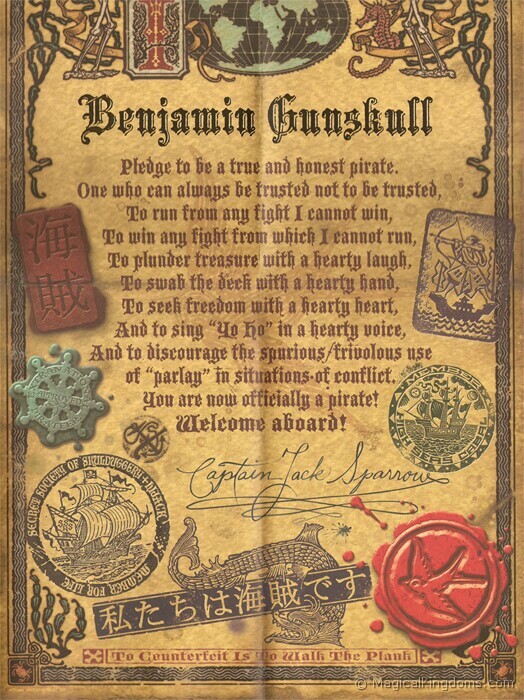 Now, as you may remember I had been given the pirate alter ego Benjamin Gunskull, the name now emblazoned in button form on my person. I was minding my own business, pillaging a cheeseburger and fries from Cosmic Ray’s when an eagle-eyed Cast Member spotted my birthday button and proceeded to lead a chorus of ‘Happy Birthday Benjamin’ with her fellow cast members and several nearby diners. I didn’t have the heart to point out the error! We can all be kids at Disney World. 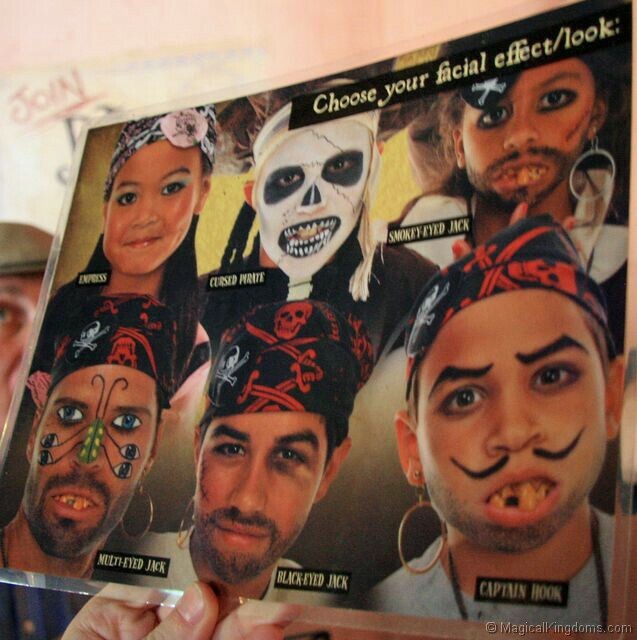 Now we can all be kids dressed as pirates at Disney World. That for me is definitely a winner! Excellent review! Thanks for all of the pics and details. 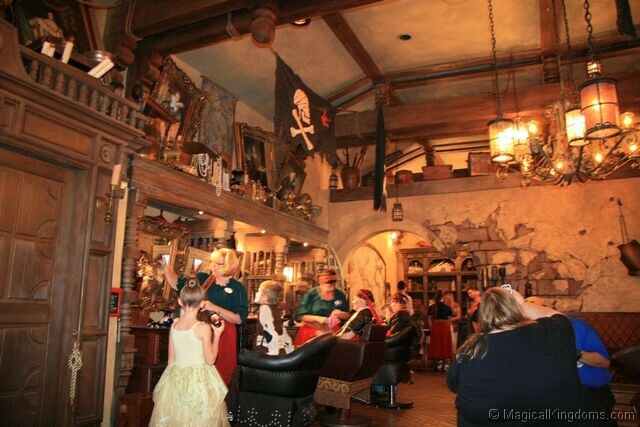 Thanks for your review, it is something I was thinking about doing with my pirate princesses on our next trip but didn’t really know much about it. Definetly going to go over now!!! !